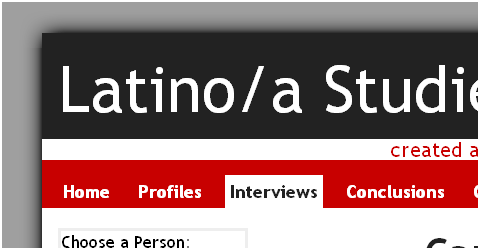 This site was created as part of a project for a Latino/a Studies class at the Ohio State University. It showcases information gathered during a quarter long project in collecting information from web sites of Latino/a Studies departments at universities across the country. Interviews were also done with key faculty and staff at tOSU and conclusions were drawn. The design was simple, straghtforward and made with buckeye colors.